“How much light of a given wavelength does my product or material transmit?”. At first glance, that may not strike you as the most interesting question. However, dig a little deeper, and this type of assessment can shed light (groan….) on a lot of things. As part of my consultancy services I can offer a simple, fast and cost effective way to get optical transmission data from a wide variety of materials. At the simplest level perhaps you are publishing work using photographic filters, and you want graphs showing the transmission characteristics of the ones you are using for your article. Sometimes, spectra are available on online, but often only as images, which can make compiling them together very difficult if not impossible. Plus you’d need to reference and acknowledge where you got them from or even ask for permission to re-use them. Filter characteristics vary as a function of thickness, so sometime the data you can find is only for the wrong thickness of glass. 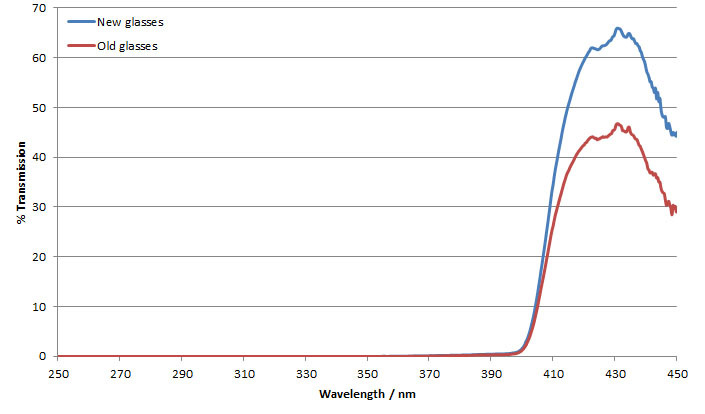 I can measure optical transmission properties of your specific photographic filters between 250nm and 800nm, down to an accuracy of 0.01-0.02% transmission, and provide the data in Excel format as tab separated variables, for you to use in whatever plotting package you need in your work. 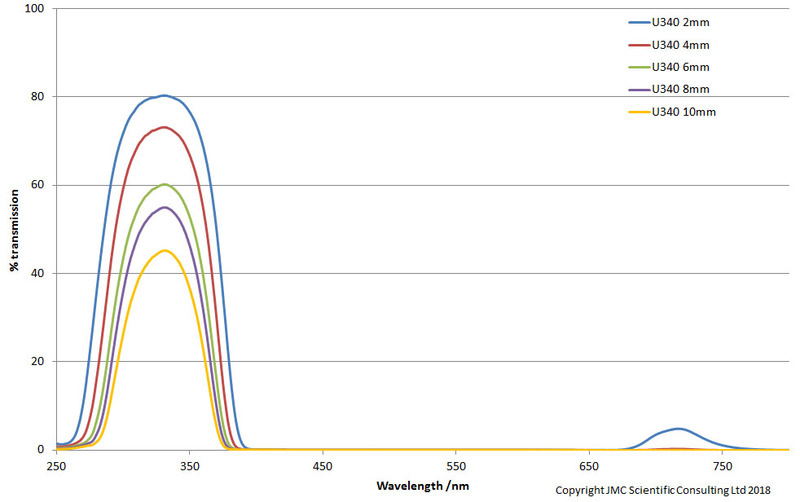 An example set of transmission curves for U-340 filters of different thicknesses is given below. How about materials analysis? 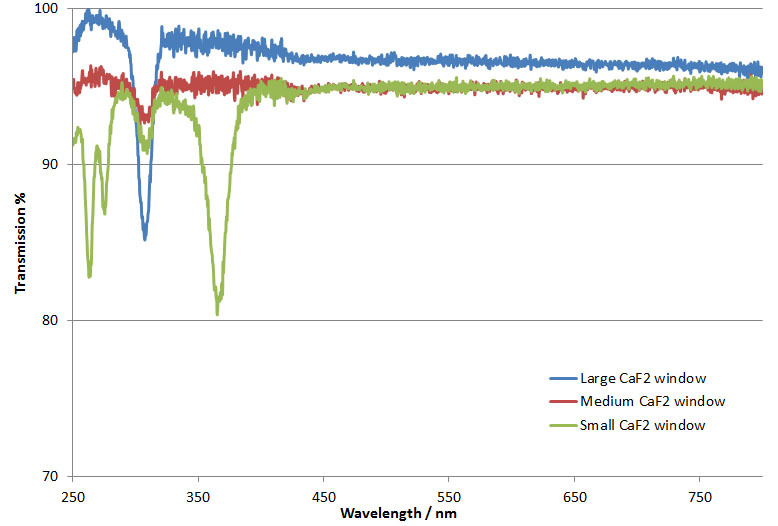 Here’s an example assessing Calcium Fluoride (CaF2) windows, and determining whether they were the same or different. I wanted to know whether three different windows were the same optically, and would transmit UV light in the same manner. As can be seen from the image below the three windows were not the same, and had different absorption properties in the UV, making them unsuitable for the job I had in mind. Or how about UV protection from spectacles? Spectacles typically have UV protective coatings, but as we cannot see UV with our own eyes how do we know what level of protection vs UV they are giving. Measurement between 250nm and 400nm can show where this cut off in transmission is, and how different coating compare. The graph below shows two pairs of my glasses, an old pair and a new pair. Thankfully even though my old glasses were a little scratched and let through less slight overall, they still protected my eyes from the UV like my new pair. I offer simple, fast, efficient and cost effective analysis of transmission characteristics between 250nm and 800nm using an Ocean Optics light source and spectrometer (DH-2000-BAL and 250-800nm FX Spectrometer) mounted on an optical stage (Ocean Optics RTL-T) for accurate reproducible measurements. If you think you need optical transmission data for any of your work, please feel free to contact me (here) to discuss your needs. With prices ranging from 35GBP+VAT per filter I can offer a very competitive measurement service.